The events included a half-day dialogue with academics, researchers, former government officials, and others; a press conference; and a full-day consultation with people’s movements and civil society groups. The events opened a space for critiquing the industrial paradigm of development that trivializes or systematically neglects the illegal and the unethical means of land acquisition by Indian investors, both within the country and abroad. The Oakland Institute’s research has long provided insight into the widespread implications of this renewed scramble for Africa by large-scale global investors. The discussion at this event centered on the Indian government’s and companies’ strategies for land investment deals, within and outside India’s own borders and particularly in Ethiopia. This also provided a landmark opportunity for examining and linking common experiences of struggles against such deals in both countries and coordinating a unified response. Another significant aspect of this event, as Anuradha Mittal, the founder of the Oakland Institute, noted at the February 6th press conference, was the fact that “it was the very first time that members of the affected indigenous community in Ethiopia had travelled across the world to spread awareness and educate members of the investor nation on the impact of land grabbing.” Nyikaw Ochalla, the director of the Anywaa Survival Organization and Obang Metho, from the Solidarity Movement for New Ethiopia, both dynamic reminders of the Ethiopian people’s dissent from their regime, explained not just the precarious position of the Ethiopian tribes being affected by what Metho called the “daylight robbery” of their land, but also shared their tangible vision of a self-reliant, non-exploitative, heterogeneous but integrated Ethiopian nation. Both of them drove home significant points about the reality on the ground in Ethiopia and the egregious impact these inequitable land investments from foreign countries, including India, have on the lives of people. Highlighting the discrepancy between the fertility of the Ethiopian land and the country’s dire level of food insecurity, Obang Metho explained the convoluted processes that led a nation of dignified, potentially self-reliant people to be dependent on international food aid. Mr. Metho said that he does not equate the ethos of the Indian investors buying up land in Ethiopia with that of the people in India and that he is not opposed to investment spurring economic development. “We want an investment climate that is good for the people of India and the people of Ethiopia,” he said. “I am not anti-investment. But I am anti-daytime-robbery. When I see the videos The Guardian has taken of the affected communities in Gambella, I can name each of the people in the video. It is like someone taking a video of your neighborhood and being able to recognize everyone and everything there,” Metho added. The issue of foreign financial aid, as the various speakers at the press conference emphasized, is particularly relevant in understanding the skewed power dynamic between India and Ethiopia. The extensive in-country research done by the Oakland Institute team and the courageous narratives of the Ethiopian people risking persecution seriously implicate the current TPLF Ethiopian regime in numerous cases of extreme human rights violations, censorship, torture, and killings of its own citizens. In a scenario where the Ethiopian government sees its own people as mere impediments, international aid translates not as a resource for the people but rather as a tool for their oppression. Thus, EXIM Bank’s, India’s premier financial institution, $640 million credit line to the Ethiopian government to expand the country’s sugar sector in the Lower Omo region must be recognized and debunked not as an altruistic gesture on the part of the Indian government, but a means of facilitating lucrative but exploitative investment in Ethiopia. The briefing paper entitled “India’s land acquisition in Ethiopia: Benefactor or Colonizer?” circulated by Kalpavriksh, INSAF, and PEACE at the day-long Global Land Summit February 7th argued that the Indian government facilitates the exploitative process by “supporting the conventional Green field foreign direct investments, merger and acquisition purchases of existing firms; public private partnerships; specific tariff reductions on agricultural goods imported to India through the negotiation of regional, bilateral trade and investment treaties and double taxation agreements.” The OI briefs released at the press conference, Omo: Local Tribes Under Threat and Unheard Voices, indicate how the Indian government further violates its extra-territorial human rights obligations to the Ethiopian people by refusing to step in when land deals struck by Indian corporate investors create adverse human rights conditions for Ethiopians in Gambella and the Lower Omo regions of the country. Both Nyikaw Ochella and Obang Metho clearly argued that they do not want Ethiopia to be insulated from other nations, but stressed that aid and investment from abroad must prioritize the well-being of the Ethiopian people. As human rights activists from different nationalities demonstrated during the course of this event, these long-term land leases for large-scale agricultural investments have devastating social and environmental implications. For example, Indian investment in Ethiopia--to the tune of $5 billion--by companies such as Karuturi, Rochi Soya, Whitfield Cotton, and more involves leasing almost half a million hectares of land over an extended period of time, resulting in a situation that is completely contrary to the “win-win” scenario presented by the Ethiopian regime. The Human Rights Watch field research in the Karuturi Global lease area in 2011 clearly demonstrates instances of land acquisition and clearing taking place without the free prior informed consent of the people living on this land. Furthermore, the disorienting cultural impact of forcefully replacing the existing pastoral economic and environmental structure with commercialized agricultural production is another casualty in this exploitative chain of events. The complete disregard for negative environmental impacts adds to the growing list of legal and ethical violations by foreign investors in Ethiopia. The India-Ethiopia land summit also brought together nearly 60 activist groups working around the various aspects of land rights within India to discuss the global problem of land grabbing and how the actions of Indian land investors in Ethiopia resonate with the undemocratic land acquisitions within the country itself. Gopal Krishna, an independent consultant, underscored the premise of the event by noting that even though the experience of each land grab is specific to an individual country, the prevalence of land grabs as an increasingly global phenomenon indicates that land investments cannot be understood until company characters are understood, as companies have no nationalities. The land struggles in Ethiopia demonstrate the fact that the remunerative investments enjoyed by foreign firms are fundamentally at odds with both the interests of the community as well as the national economy. 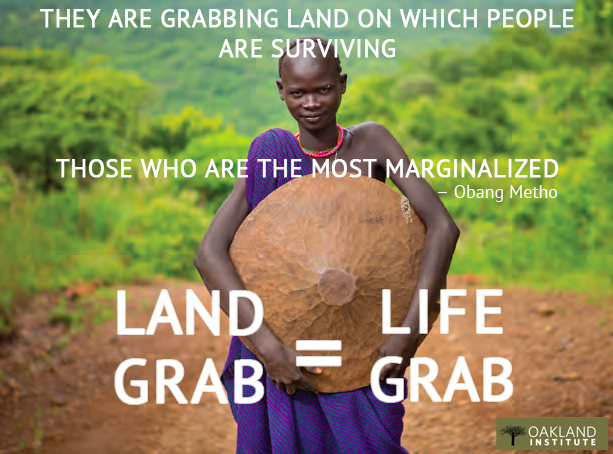 This conference showed how globally this phenomenon of land grabs was linked to the lack of accountability of companies and their increasing monopolization of natural resources. The common thread between the forced displacement of tribes in Ethiopia’s Gambella and Lower Omo regions and the encroachment of private- and public-sector investors on land in India is the fact that in an increasingly globalized, capitalist, or nation-state dominated world the voices of those at the lowest rung of the economic and social totem pole are continuously silenced. Also crucial is to identify the current model of “development” itself as fundamentally flawed, as it treats nature as a commodity or a dump and humans as consumers in a vast market. The conference aimed at raising awareness of the need for an alternate development paradigm, beginning in Ethiopia and India, that would not be inimical to ecological sustainability and socio-economic equity. The Ethiopian and Indian activists’ articulation of the loss of their land, not merely in quantitative terms but also with regard to culture, tradition, and history, further demonstrated the incalculable loss such corporate encroachments entail. The conference was also a platform for exchanging, brainstorming, and strategizing about global resistance to land grabs. Despite many striking similarities between the insidious effects of corporate land investment in Ethiopia and India, organizing a conference such as this would be impossible in Ethiopia. Although the Indian government is often complicit in ethically and legally questionable corporate land investments in different parts of the country and has detained dissenters undemocratically, the relative freedom of the press at the conference in New Delhi stands in stark contrast to the circumstances in Ethiopia. For example, although the Indian land rights activist Dayamini Barla was arrested in 2012 after using the Right to Information Act to block construction of Jharkhand’s largest steel plant on fertile land, she was released after two months because of immense media pressure. While this type of illegal detention is commonplace in the Ethiopian struggle, the absence of a functional democratic system prevents the possibility of resistance through legal framework. In the absence of an independent press due to severe censorship laws, resistance to the existing Ethiopian regime and its policy of land grabs can come only from massive social protest and international pressure. The organization of this global level initiative was a step in this direction. 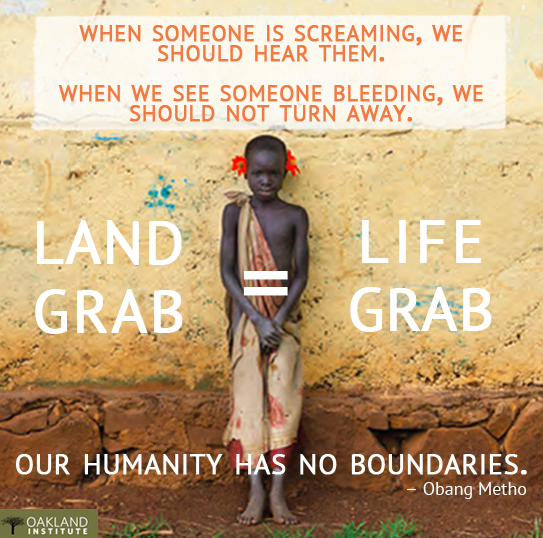 Furthermore, exploring the common experiences of land struggles within Ethiopia and India only serves to highlight the increasing need for joint action and deliberation against land grabbing across the world. With a Master's degree from the University of Delhi, Janhavi is a recipient of the King's College London Overseas Research Scholarship which enables her to complete her dissertation on the ‘Literary Planetarity of J.M.Coetzee's Fiction’. A literature and cultural studies scholar, Janhavi's research interests and forthcoming publications and public talks have focused on cultural narratives around biogenetic capitalism, as well as, on inventive interdisciplinary approaches to the African Anthropocene. Janhavi is particularly interested in comparative cultural expressions of subaltern agroecological movements—particularly around climate change in South Asia and Southern Africa.